As the world's leading manufacturer of paper 3D glasses and innovator in 3D promotions, we introduce IYF 3D anaglyphic glasses. (FYI: It stands for IN YOUR FACE 3D). 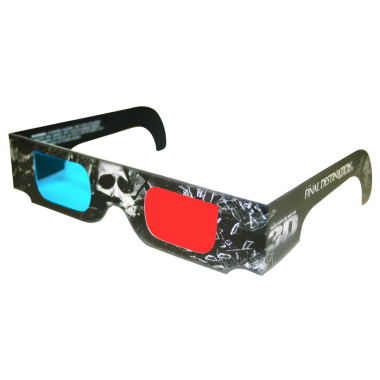 Our re-formulated and supercharged 3D glasses with red and cyan filters coupled with our expertly converted 3D images of your ad or website will blast your promotion into the third dimension. SEE and be seen with our IYF 3D anaglyphic glasses as you plan your next print campaign, magazine ad, direct mail flyer, or website. After manufacturing well over one billion 3D glasses in the last 20 years, we have a right to be IN YOUR FACE. Traditional red/blue and red/green lenses are also available.